George R. Daniel, 82, of Berrien Springs, died early Saturday, December 1, 2018, at his home. Funeral services will be at 9 a.m. Sunday, December 16, at Pioneer Memorial Church on the campus of Andrews University, Berrien Springs, where he was a member. Burial will follow at Rose Hill Cemetery. Memorial donations may be made to 3ABN or Adventist Frontier Missions. Friends may visit with the family from 5-7 p.m. Saturday, December 15, at Allred Funeral Home, and online condolences may be shared at www.allredfuneralhome.com. 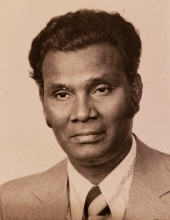 Survivors include his wife, Vimala; two daughters, Sabeulah Bates and Lynda Daniel-Underwood; five grandchildren; and a brother, William Daniel. Preceding George in death were five siblings: Ruby, Victor, Moses, Stephen, and Jacob Daniel. George Rajan Daniel was born in Madras to Chandragason and Grace Daniel on January 26, 1936, one of seven siblings. His dad was a driver for the British company, Buckingham and Carnatic, and his mother, although a graduate of Wesley Mission High School, was a homemaker. His parents were baptized into the Seventh-day Adventist church during their marriage. Both his parents died when our father was young, his mother when he was 7 years old, and father at 21 years. He was sent to live with relatives, but his yearning for an education led him to leave and join James Memorial High School in Prakasapuram, Tamil Nadu. In the 5th standard, he met his wife-to-be, Vimala Miller. After completing his secondary education, he left for Spicer Memorial College where he completed a Bachelor’s degree in Religion. After graduation, he and Vimala Miller were married and spent the next year in South India for field work. His daughter, Sabeulah, was born during this time. They returned to Spicer Memorial College as new parents, where he taught Religion and Indian Music. They added to their family with the birth of Lynda. Education to our father was important, so he decided to pursue a Master’s degree in Religious Education at Andrews University, graduating in 1973. During this time, his family joined him in the United States. While preparing to go back to India to serve, he and our mother were involved in a serious car accident leading to a lengthy hospital stay for her. It was during this time our father decided to stay in the United States to assure Vimala had the best care. In order to provide for his family, he worked several jobs. This included a colporteur for Lake Region Conference in Benton Harbor and Fleetwood RV in Elkhart, Indiana while working on his teaching credentials. He finally got a teaching position at Benton Harbor School System. He worked here for almost 25 years before retiring. Our father knew hardship as a child and wanted to assure his siblings were able to enjoy life in the United States. He supported each of their entries to this great country and housed each family until they found a job. Many of you know and can appreciate his hospitality. No one who entered his home went hungry, if you had a need, he sought to a way to help. There were many trips to Chicago, Battle Creek, Maryland, California; he loved to drive. His favorite game was Make-a-million, which he played most every Saturday night. In retirement, our father enjoyed spending time with his children, Sabeulah and Lynda, and their husbands, Brian and Matthew, and his precious grandchildren, Patrick, Eric, Jordan, Charity and Justin. He also loved this community, assuring students were fed and the Indian church survived. Our father was a prayer warrior and prayed for every family and student by name. You have fought the good fight, you have finished the race, and you have kept the faith, Husband, Dad, Thatha, Uncle, and Friend. We will meet you when He comes. To send flowers or a remembrance gift to the family of George R. Daniel, please visit our Tribute Store. "Email Address" would like to share the life celebration of George R. Daniel. Click on the "link" to go to share a favorite memory or leave a condolence message for the family.